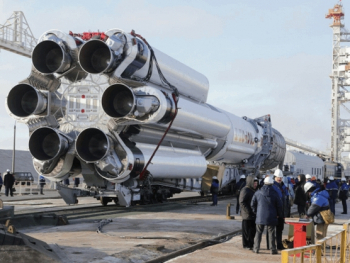 A Russian Proton-M was in action on Wednesday, lofting the Ekspress-AM7 communications satellite on what was a multi-hour flight to a geostationary orbit via its Briz-M Upper Stage. The Russian workhorse launched from its traditional home at the Baikonur Cosmodrome in Kazakhstan at 22:05 UTC on a nominal first leg of the flight, before successfully deploying the spacecraft. The Proton booster tasked with launching the satellite was 4.1 m (13.5 ft) in diameter along its second and third stages, with a first stage diameter of 7.4 m (24.3 ft). 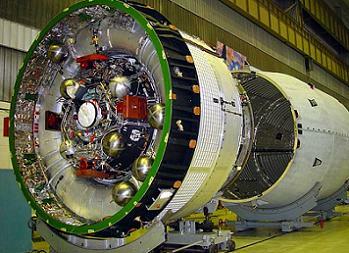 The overall height of the three stages of the Proton booster is 42.3 m (138.8 ft). The mission was tasked with sending the spacecraft to its transfer orbit via the Upper Stage called the Briz-M, which carries out multiple burns to deploy the satellites into their respective orbits. The Briz-M for this mission had the classification 14С43, and was the Phase 3 version which sports improved energy-mass characteristics. As per the mission plan, the spacecraft/upper stage separation took place 9 hours and 13 minutes after liftoff. The Ekspress-AM7 satellite is a Eurostar E3000 platform and has a mass of 5,712 kg and sports 24 C-band, 36 Ku-band and 2 L-band transponders. It is expected to have a service life of 15 years. It also holds xenon and hydrazine for its onboard propellant needs. The launch success for this satellite follows a patchy success rate in lofting this breed of spacecraft, following the loss of Ekspress-AM4R, after a failure during third stage flight. An investigation into that failure identified the probable cause of the failure was the loss of structural integrity of a bolted interface that attaches the Stage III steering engine turbopump to the main engine structural frame. The loss of integrity led to an excessive steering engine turbo pump vibration environment that damaged a fuel inlet line to the oxidizer gas generator, resulting in a fuel leak. The loss of fuel led to the premature shutdown of the turbopump and loss of stage control authority and ultimately loss of mission approximately 545 seconds into the flight. The Ekspress-AM4 satellite was also lost in 2011, after an issue during the fourth burn of the upper stage. The most recent launch of the Ekspress-AM6 satellite also suffered issues during its ride on the Briz-M and was deployed into a lower than planned orbit. However, it will eventually get to its designated orbit under its own propulsion.